It’s Saturday and I have a little time to reflect on last week’s activities. I woke up this morning recalling the amazing creative energy that filled the spaces our group inhabited. 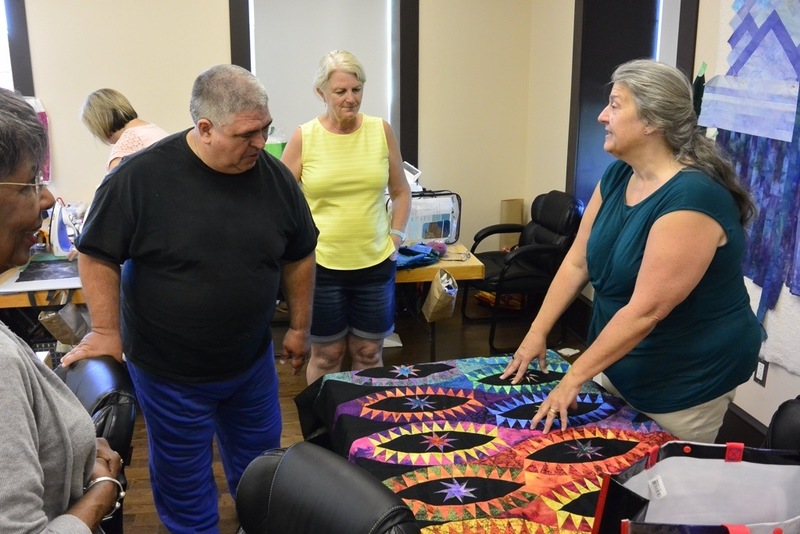 Thursday afternoon we opened our doors to anyone who was a little curious about what was taking shape after three full days of dyeing and sewing. 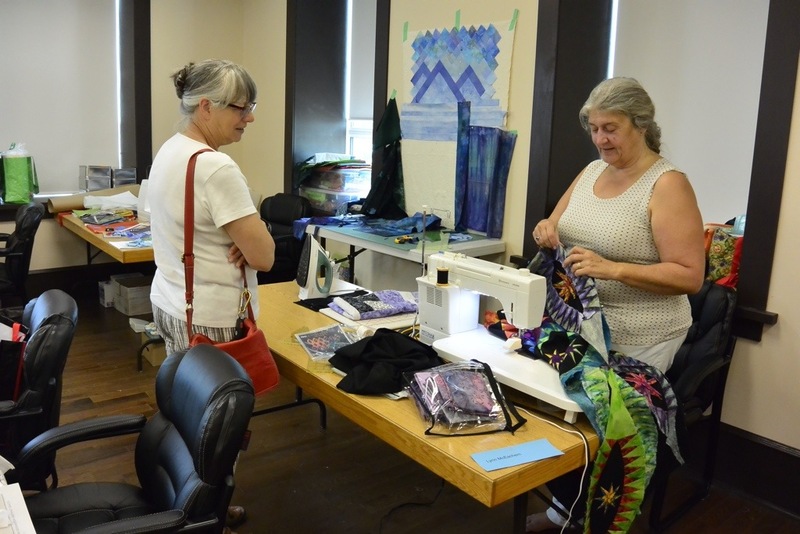 Leona (left) attended AQC 2014 and was checking out what Gillian had accomplished in the dye room this year. 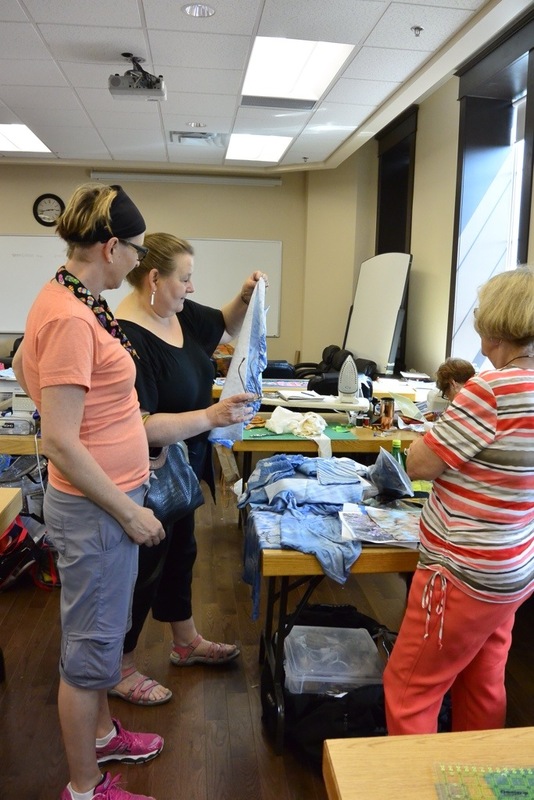 Debbie (far left) admiring Alison’s indigo dyed pieces. 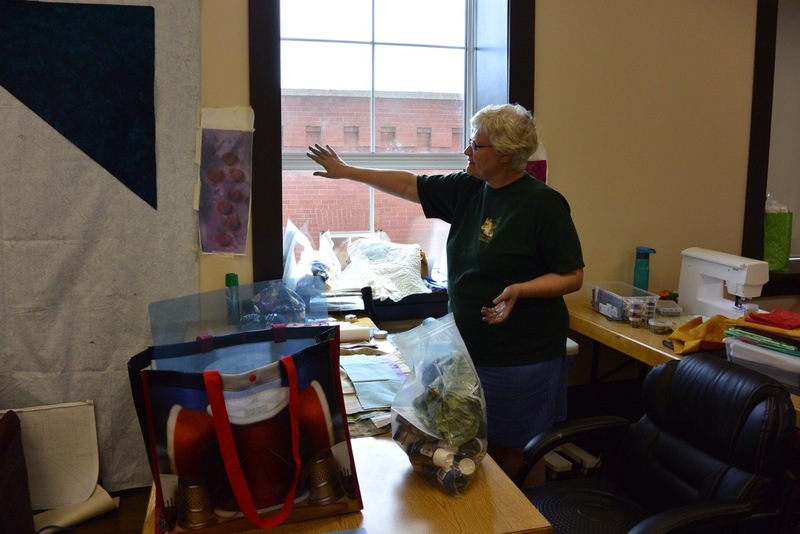 Several of the visitors are going to attend Week 2 of AQC and we’re happy to see what might be their “stash of hand- dyed fabrics” in only seven days…. 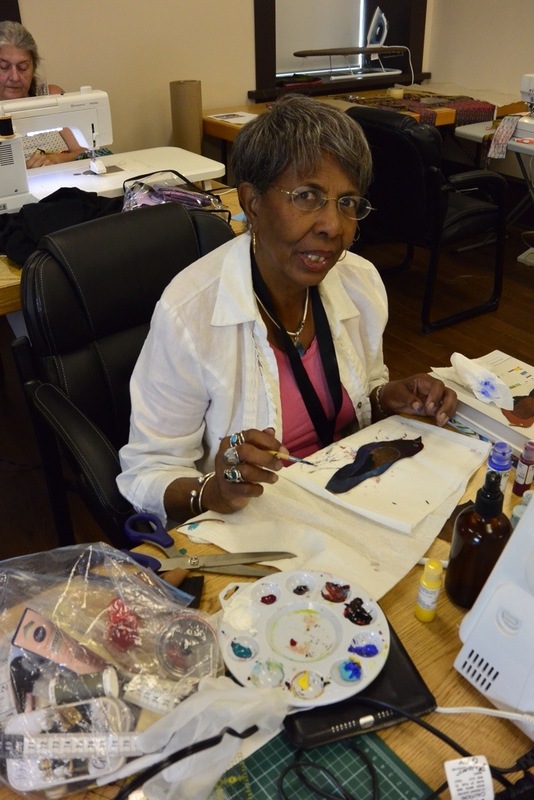 Dorothy used her hand-dyed fabric and added some stenciling with Shiva oil sticks. 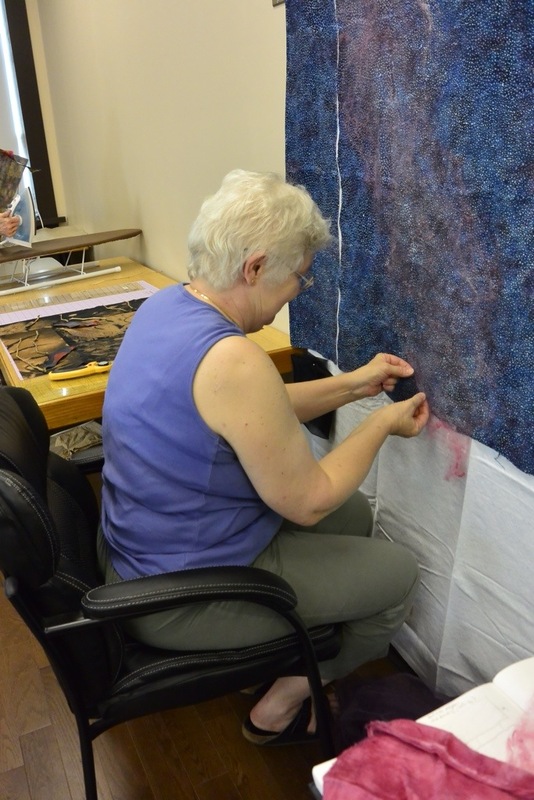 Marilyn discovered painting on fabric during her class with me at Quilt Canada this year. She was busy creating several birds for a nature inspired piece. Minnie’s Milky Way over Grasslands National Park was taking shape by late Thursday afternoon. Berna and Lynn in conversation over Lynn’s accomplishments in class this week. One of the monastery’s brothers is a painter. He dropped by to see what had come out of the dye jars from earlier in the week. 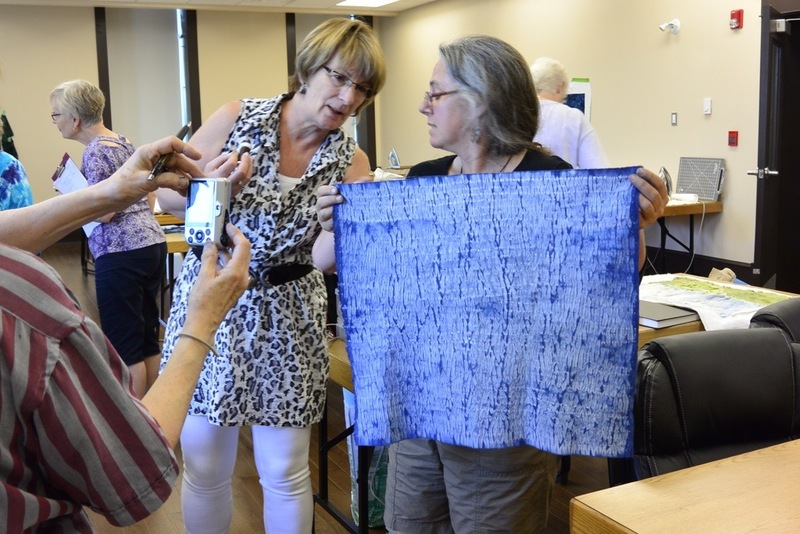 Helene revealed her Shibori indigo piece as we were packing up on Friday. A weary group just before we said good bye. Elinor and Lynn are absent due to an early morning departure. We spent the last evening socializing and deepening new friendships. I even have a request for three participants sharing a room in 2015! 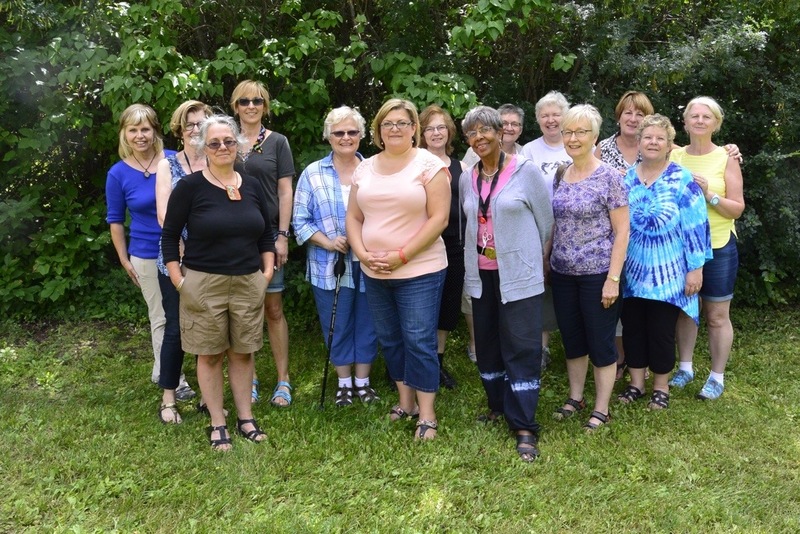 Thank you to Wayne Dirkson for capturing this creative (and slightly tired) group! Thank you to all the participants for you support and dedication. 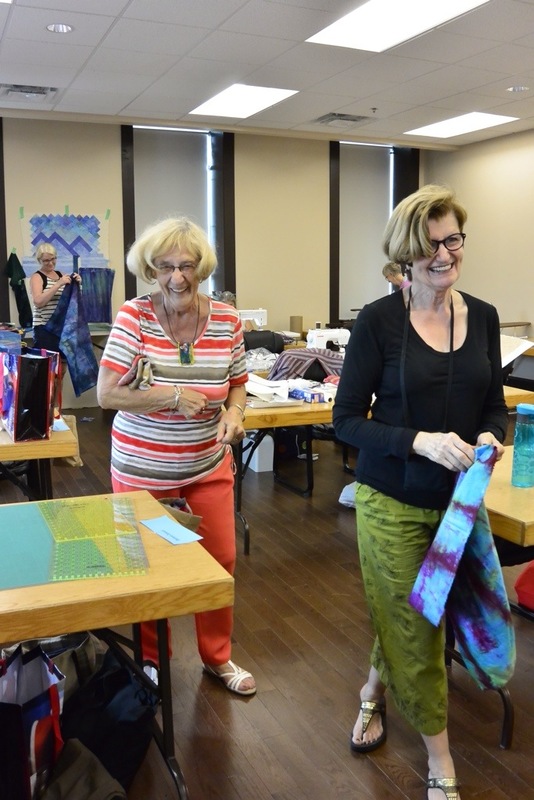 Art Quilt Campus could not unfold without your enthusiasm and sense of adventure. 26 Jul	This entry was published on July 26, 2014 at 10:43 am. 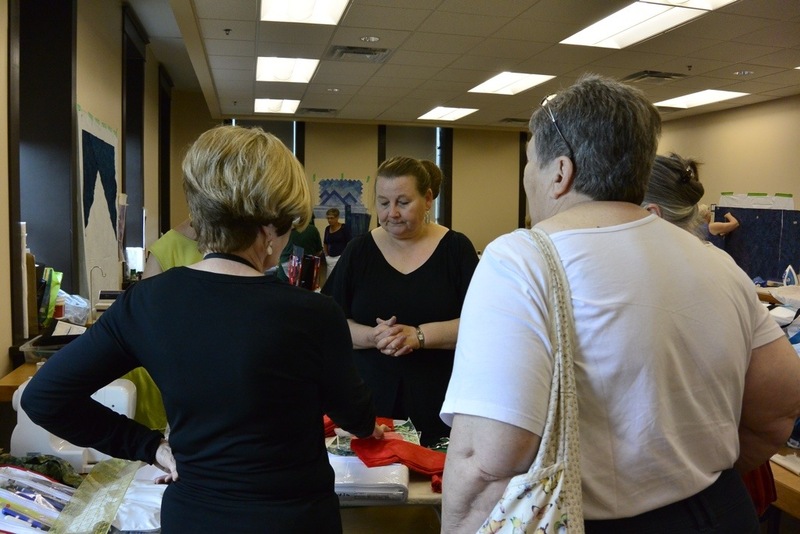 It’s filed under Art, Art Quilt Campus, Creativity Update, Design, In the News, Journaling, Networking, Special event and tagged Art Quilt Campus 2014, final recap of week 1 AQC, open studio day. Bookmark the permalink. Follow any comments here with the RSS feed for this post. Just being in the room with all the campers one could feel the vibrations caused by the dying classes, working time, inventing new techniques along with happiness of learning together with a super teacher. Made me jealous and wishing I had been part of this group. There is always next year tho. Unfortunately we did not get away as planned as I had been ill for quite a few days, but considering that I could not have made the camp anyways. The facility seemed to be so very handy for everything too which makes for happy students and teacher. IT WAS GREAT TO SEE YOU ALL AND YOU WORK. And just what makes you think that??????? Naturally put my name on the list. I made the mistake of not being there this year, why would I be so silly again. Have fun with the next group. Are we invited to come again next Thurs to have a look???? Great, Leona! And yes, the doors are open again on Thursday from 2 till 4 pm for a drop in visit.